For anyone interested in the roots of the current maker culture and its architectural expression, the Seventies and Eighties’ alternative culture is a first stopping-off point. Self-build, community architecture, co-ops, and a version of maker culture, which itself stood on the shoulders of the handicraft orientated arts and crafts movement at the end of the nineteenth century, were all at the heart of this long-gone era’s zeitgeist. It was also the period when a contemporary sustainable, or, as it was known then, environmental architecture, began to emerge in Britain. 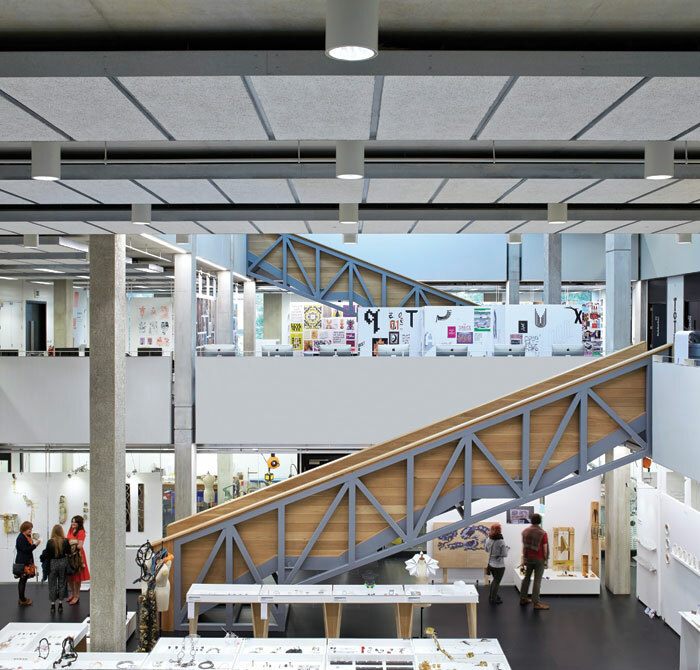 One example of this culture was two young architects, who arrived in Bath in 1978 and, calling themselves the Architecture Shop, began a 35-year plus journey, which led them to becoming one of the most influential and successful practices in the country. The late Richard Feilden and his fellow Cambridge University friend Peter Clegg likely never imagined where their proto-green FeildenClegg practice would lead; joined by other Cambridge friends they would spend the first years doing extensions, sharing lunches at work, living communally, restoring farmsteads, and running building companies and, as far as Feilden was concerned, not bothering with Part 3 architecture accreditation until well into the mid-Eighties. It was also part-and-parcel of a culture before, if not on the cusp of the computer age, immersed in an earthy self-sufficiency, community — a profoundly rural vision of its possible green future. For the first 20 years FeildenClegg pioneered projects that set the pace and direction of environmental architecture. Compare this to today. Feilden Clegg Bradley Studios (FCBS) as it is now known, regularly wins £50m-plus projects while accruing a steady flow of national and regional awards, most notably the 2008 Stirling Prize for the Accordia housing project in Cambridge. This backdrop has ensured FCBS has maintained a reputation as one of the best-regarded British practices, and one that young, sustainability-minded, idealistic and ambitious students are drawn to applying to work at. Amid this topography the sources of this past might seem to be irrelevant. But actually that past appears to be being replayed. A steady stream of young practices have set up over the years, after learning the professional ropes, and gaining experience as junior staff at the practice: Architecture 00 and White Design to name but two. Peter Clegg once said that he liked to think that the offices starting off after working in the studio carry some of FCBS’ DNA into the wider world. A recent tranche of small practices are doing just that, each highlighting making, natural materials and rural concerns, and the kind of getting on-with-doing that has become so popular in Hoxton, Hackney and Shoreditch warehouses, as well as in cooler European postcodes. Clegg points out how there are young staff ‘absolutely obsessed with materials, making and building’. They include Stonewood Design, founded by Nicola du Pisanie and Matt Vaudin, with their Pod Gallery and award-winning Myrtle cottage building; both spent 10 years at the Bath office. Feilden Fowles, founded by Richard Feilden’s son Fergus and his friend Edmund Fowles, has been developing a cross-section of projects highlighting making and natural materials, and feels like it’s very much following in — and building on — previous generation’s footsteps. 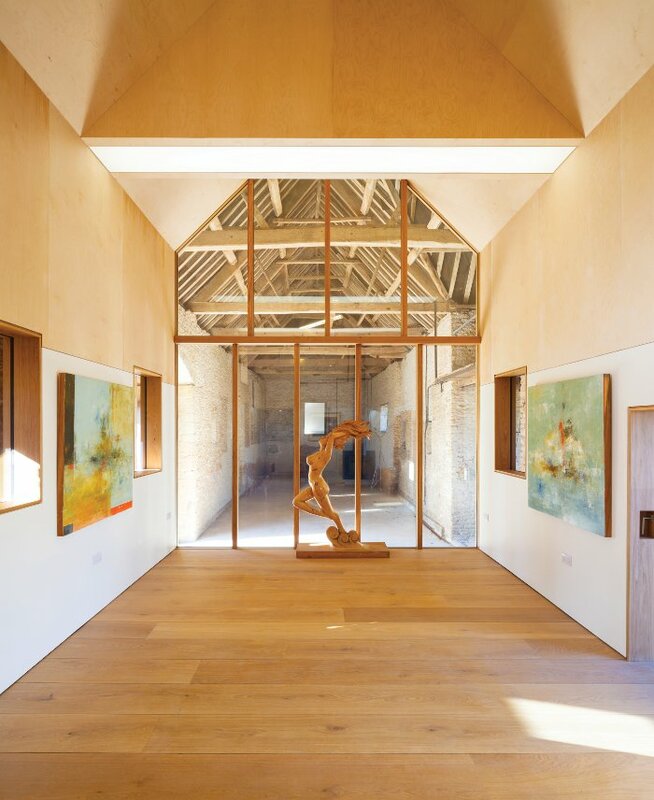 Millar Howard Workshop is another, which while less immediately connected (Tomas Millar spent a week as a teenage intern in the Bath office) is geographically within FeildenClegg’s early sphere of influence in Stroud and feels spiritually akin, and very much aligned with the Bath diaspora. And there’s the young team from FCBS’ London office, which won the Look In Look Out Observatory project. Younger by a decade, this mid-20s group, with its fascination for making and sustainability, illustrates how the ingredients that fired the early FeildenClegg, continue to tumble inspiringly through the generations. One of FeildenClegg’s early projects, and a high-water mark, was a new performing arts building in 1996, the Olivier Theatre, designed for the independent progressive school, Bedales. 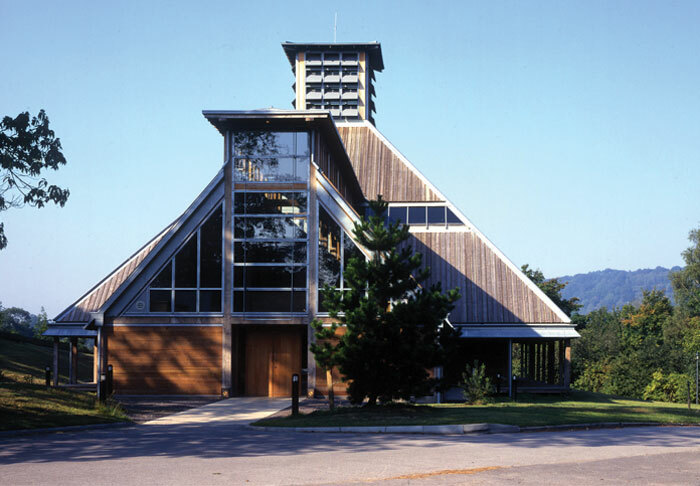 It had an experimental oak-frame structure, which also resolved passive ventilation and heating challenges. The theatre made explicit connections to Bedales' wellknown arts and crafts tradition, but was also a late 20th-century counterpoint to Earnest Gimson’s oak frame Memorial Library, built by furniture makers and master builders Sidney and Edward Barnsley. True to the school’s way of integrating the arts into full-body learning, pupils worked on the build, helping with the construction. There were other FeildenClegg arts and crafts inflected buildings too: the Iona visitor centre (its first competition win) and a string of buildings for the Rudolf Steiner Camphill movement (another branch of the alternative education world), including an early highlight — the Lantern Centre, near Bournemouth. The Olivier Theatre, however, was to be the last of the arts and crafts strand as FeildenClegg started to become a more conventional, largescale studio. That was in 1996. Twenty years on, the rather different FCBS handed over its first new Bedales project since the Olivier Theatre, bringing the story full circle. 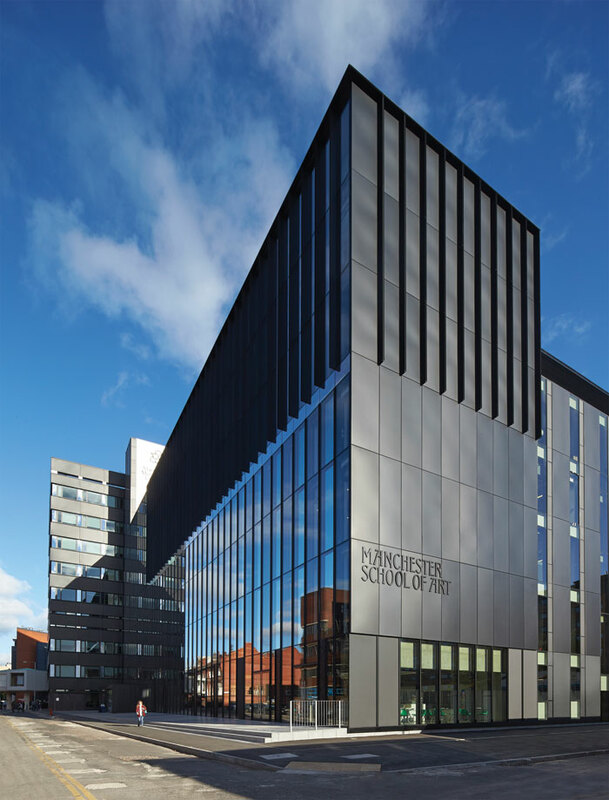 Not only this, but also the completed project, the Arts and Design building. 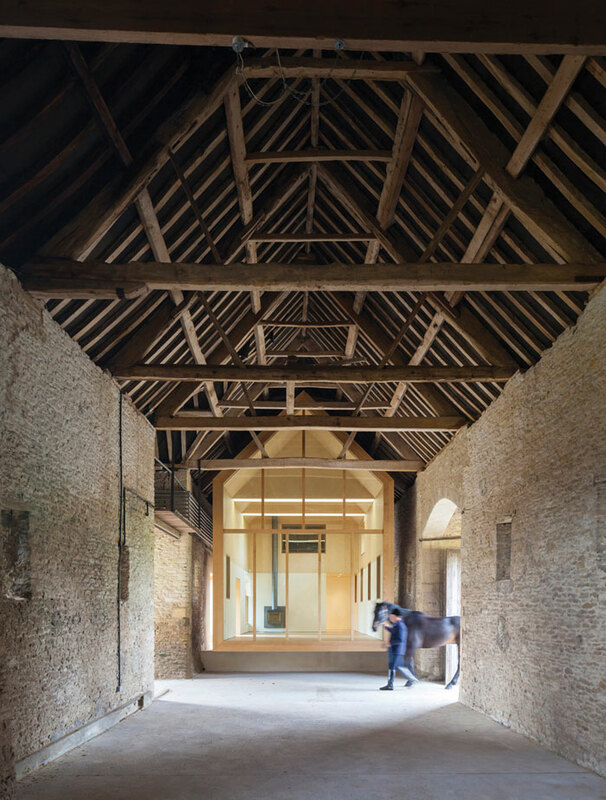 It provides a vivid comparison with the earlier green-hued, romantic building — a stone’s throw from this new stripped back, minimalist barn structure. There is an external timber staircase and open upper-floor corridor rounding the whole building, fronted by an appealing latticed rain-screen facade. The contrast between the two buildings — one highlighting the performing arts, the other design arts — are symbolic of cultural and building changes in the intervening years. If you include Gimson’s 1919 Memorial Library you have a 100-years of architecural evolution. The new building’s ground floor is given over to carpentry and woodwork, there are CNC machines, along with a fashion and jewellery makers’ studio. Upstairs open-plan fine art and ceramics studios open out on to decks for working outside. 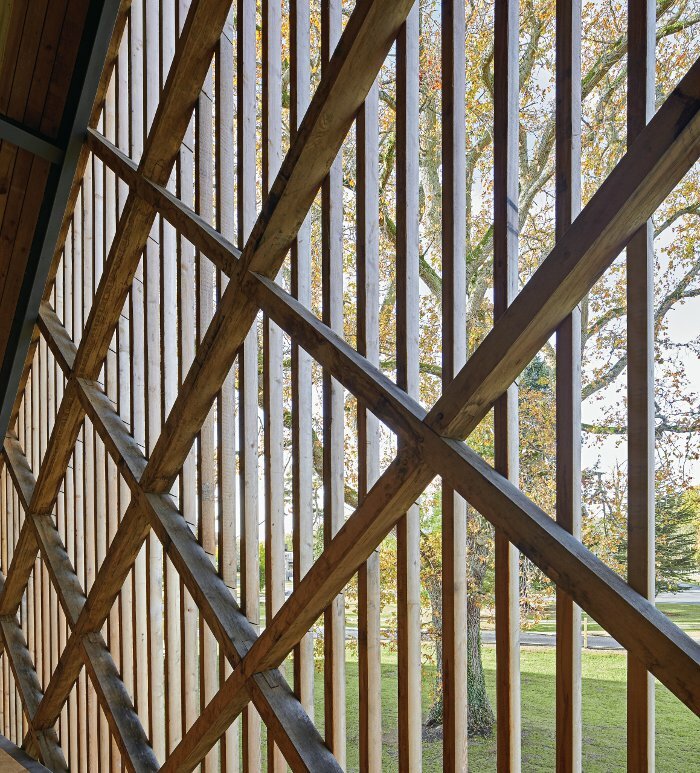 The oddity of the steel-frame box in a school celebrated for its arts and crafts heritage and historically for its timber framing, in a way cuts the link to the Memorial Library and the theatre. A longer-term connection with the region’s timber culture — the South East is the third most wooded part of Britain — is fissured as well. Jarman also cites Swiss German and Norwegian references, Valerio Olgiati, Jensen & Skodvin and the ubiquitous Peter Zumthor, which introduces an interesting bridge between Alpine Graubunden crafts-based building and the carpentry-inflected experiments sitting beside each other at Bedales. A similar point is made by Clegg when he highlights how Jarman and his team played with digital fabrication during the Manchester School of Art design process. Here, pillars to the central atrium in what Clegg describes as ‘essentially a big art shed’ integrate imprinted decorative figures, bringing digital crafts into the equation. That is a long way from the Bedales experimental oak frame and the promise it seemed at the time to hold. FeildenClegg moved into the big time but maybe its arts and crafts history is not a thing of the past and some of the new wave of studios, springing out of the Bath practice are clearly exploring these once dormant paths again.